Sri Lanka Podujana Peramuna (SLPP) yesterday stressed that the independent parliamentarian Athuraliye Rathana Thera acts according to the propaganda of India's Research and Analysis Wing (RAW). Speaking to media, at a press conference in Colombo, SLPP member Renuka Perera said that it was Rathana Thera who opened the door to import rice from India. "Rathana Thera first said that manure given by the government as a subsidy is harmful to the soil and the body. Taking this as an excuse, the government cut the fertilizer subsidy. It directly affected paddy cultivation and now we can see the result," Perera said. The government has now taken steps to import rice from India to control the shortage. As we all know, India wants to be a food supply centre of the region by 2018. Anyone who has sense can clearly see the link between these two factors," he added. 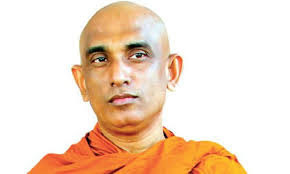 Perera further said that it was Rathana Thera who guided the country towards India's plan and he is clearly a RAW agent. Taking that path he shows, the government will import every essential food item from India in the future, he stated.